Last week I addressed the way in which I ‘misbehaved’ whilst playing Dishonored, taking the game (and myself) to a much darker place than the game creators anticipated. This week, I wish to summarise how myself and a friend made a mockery of Lara Croft and the Guardian of Light. The main aim of this writ-up is to remind you of all the times you’ve misbehaved in games, but I’m also hoping you’ll try this game out for yourself. The Local Co-op Game is a rare breed. 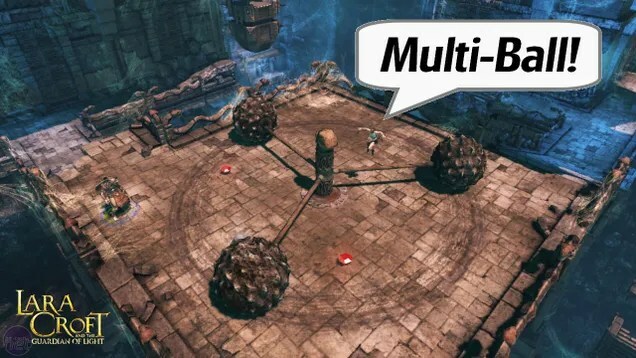 Once upon a time, the term “multiplayer” usually inspired thoughts of split-screen and friendly rivalry but nowadays playing with strangers across the world is more commonplace. Here ends the old man grumble. The point is: when you do find a good local multiplayer game, it’s something to be cherished; and Lara Croft and the Guardian of Light is a great game for you and a mate. Firstly, Guardian of Light is a co-operative game in the fullest sense. You and a friend must fully cooperate if you are to make it through the game and find all the collectibles. One player takes control of Lara, who is equipped with a grappling hook and cable, whilst the second player controls Totec, a Mayan stereotype armed with spears. Both characters can use an array of other weapons – Totec can use assault rifles with proficiency because the-game-says-so-shut-up – but between gun fights the two characters must use their respective tools to traverse obstacles. 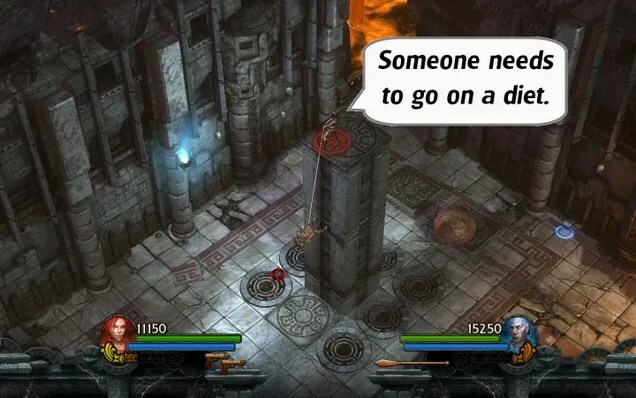 Totec can throw up to three spears into walls to provide balance beams across spike pits; Lara can winch herself up walls or can create a tightrope to nearby ledges. When both characters are holding an end of the grappling hook cable, one character can be lowered down safely. Some bonus rooms require a combination of these skills (and some ingenuity) in order to claim the prize. It’s this focus on teamwork that makes Guardian of Light a really entertaining Local Co-op experience. It’s a shame I had to ruin it. I and the friend I was playing with disagree on how the silliness started. We both know that it began when I dropped him, but I state that it was an accident, whilst he believes it was on purpose. He/Totec was dangling over a cliff face, abseiling with the use my/Lara’s grappling hook, reaching out for a hidden treasure, when I accidentally released a button and sent him tumbling to his doom. As with every death, he respawned nearby a moment later. We laughed about it, but we both knew he’d want payback. A short time later I was balancing on a well-placed Mayan spear above a nest of spikes ready to jump to the far side. My companion suddenly loosed three spears in random directions. Why? Because there can only be three spears on-screen at once. When he threw the fourth spear, the first one disappeared. I was quick enough to take flight a split second before my perch sparkled out of existence, but from then on we were wary of each other. Have you ever tried a ‘Trust Fall’? You have to fall backwards, whilst a colleague promises to catch you (if they don’t you’ll hit the floor) and then you swap round. Now imagine that you’re doing this for two hours, but you’ve decided to let the person fall once for every five falls. That is what playing Guardian of Light with me (or my friend) is like. We should have been a team, working together to succeed, but it was just too much fun to trip the other person up. You come back to life so long as the other person stands, so there’s no need to feel guilty. So there we were, two men in our mid-twenties, trying to convince each other that this time we’d work together sensibly, unable to stifle our mischievous giggling. Things got worse when we took another ingredient from the game and added into the mix of stupidly: unlimited explosives. Press a button and an explosive is planted at your feet; a second press will remote-detonate the bomb. Whereas pistol and rifle fire passes your partner by, this explosive can hurt you and your friend. So, naturally, these bombs were used to periodically test each other’s reflexes. We wouldn’t actually try to blow each other up; simply dropping a bomb near your ‘friend’ to spook them was enough entertainment. And then there is the greatest part of the game: the balls. You see, many of the games puzzle rooms revolve around giant spheres, which must be rolled into pressurised sockets or into holes in the floor to unlock a gate or to gain access to other areas. Sometimes these balls are covered in spikes and must be avoided or use as a weapon against your enemy. This feature is nothing new to gaming. They are a simple, practiced way of building logic puzzles into an adventure game. Much less common though, is the way that these orbs react to the use of explosives mentioned above. If a puzzle ball sits within the blast radius during detonation, said ball will soar into the air before dashing across the room. Anything in its path will be forced out of the way. If it’s a spiked ball being pinballed, then anyone in the way is getting squished. And so the silliness continued. When we weren’t pushing each other into murder holes or throwing C4 at each other, we were playing Uber-Dodgeball. Where possible, we would roll Bally (because of course it had a name) with us through the level, firing him at each other as we went. In wide, open rooms this pastime evolved into a fully-fledged sport. We would stand on opposite sides of the room and use explosives to bat the ball towards our opponent. We’d win a point if the ball hit the back wall. It was a cross between volleyball, table hockey and siege warfare. Needless to say, our run-through took significantly longer than expected. The games platform, puzzle and action-shooter areas are challenging enough without being betrayed, blown up or bowled over by your own ally. Being laughed at the whole time, I might add. Plus the fact that the game offers you a quick respawn means that there is always time for revenge. Silly, senseless, slapstick revenge. 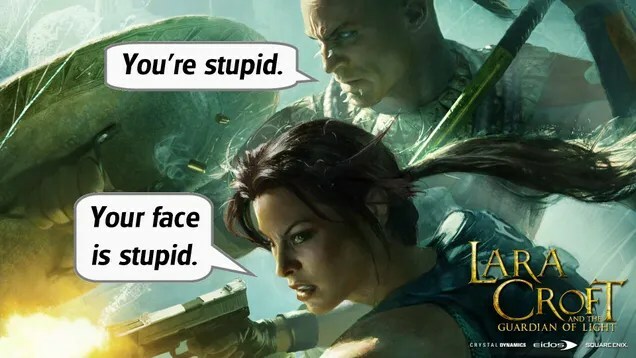 Lara Croft and the Guardian of Lightnever asks to be taken completely seriously. It has a comic book look to its cutscenes, there are traces of humour in the dialogue and the main villain is accidentally hilarious (he appears at the start of almost every level, boasts about his unstoppable power, then runs off so he can do the same thing at the start of the next level. Mwah-ha-ha, run away, repeat). Nevertheless, the game never implies that the players should be as silly as we were. We were offered the grappling hook, spear, bombs and balls as useful tools to aid us on our quest. Instead we misbehaved, and had a lot of fun tripping each other over. Did you have a similar experience with Lara Croft and the Guardian of Light? What other ways have you been very silly whilst gaming? How often do you push a video game just to see if it will bend or break? Leave a comment below!